Amazon Web Services (AWS) is obviously making it very difficult for competitors in the public cloud market. That could not have been made more clear than how IBM and Rackspace are choosing how to make their presence felt this week at AWS re:Invent. For the past week, IBM has been getting trashed for its anti-Amazon ads that declare their superiority to AWS. The ads are a sad reflection on IBM and play very nicely for Amazon, which is quite happy to point out how the campaign is more about serving the customer than trashing competitors. 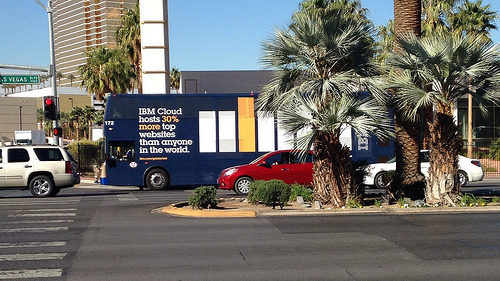 During the general session this morning, Senior Vice President Andy Jassy was happy to call out IBM for trying to fool customers with splashy ads on tour buses cruising the streets of Las Vegas. The ads are classic old-school marketing with somewhat manipulative messaging. Rackspace is not doing itself any favors, either, with its efforts to draw developers out of the AWS conference. Just outside the AWS re:Invent conference at the Venetian Hotel, a group of girls in short shorts handed out invitations for a Rackspace party at Gilley’s, a bar in the Treasure Island Hotel here on the Las Vegas strip. The company is falling behind AWS, which has by any measure proven to be a favorite among the developer set. Rackspace needs more workloads on its cloud service. To get those workloads they need more developers to build apps. And so obviously, the logical thing to do is spend tens of thousands of dollars on a party during an AWS conference with the promise of beer and all the cheap bar food a programmer can eat. Rackspace’s bro-ish ways don’t make it look so classy and IBM is not doing much better with such a poor advertising campaign. The truth is AWS has such a commanding lead over both of these companies. To market in such odd ways just cements the fact that they are distant followers and should probably be spending their money differentiating what they do instead of slinking around an AWS conference.